Recommended by Marc Goodman in "Tools of Titans". In terms of business, some of the must-read books I would mention are Hooked by Nir Eyal, Web Analytics: An Hour A Day by Avinash Kaushik, Call To Action and Always Be Testing by Bryan Eisenberg, Epic Content Marketing by Joe Pulizzi, How To Build Websites That Sell by Peep Laja, Content Chemistry by Andy Crestodina. The book everyone in Silicon Valley is talking about. Hooked gives you the blueprint for the next generation of products. Read Hooked or the company that replaces you will. The most high bandwidth, high octane, and valuable presentation I have ever seen on this subject. I am reading Nir Eyal's "Hooked" - how to build habit-forming products. I have this overarching question in my head -- how do we use technology as a tool to make doing good a habit for someone? My favourite business book is Hooked, by Nir Eyal. It talks about building habit forming products, apps that integrate into people's lives and make them easier or better in some way - but to do that, these products have to create a new habit, like putting your expenses in a budgeting app, adding missing ingredients to a shopping app, or in our case marking chores as done in Homey app. Almost every consumer facing startup needs good engagement, and I've recommended this book to countless founders. It's definitely not only for apps that rely heavily on gamification, as many people thought. It provides real world examples for many different business cases, and the ideas are usually easy to apply, test and integrate. We've used some ideas from this book, but we're still not done with it. I’m reading 3 books now and it really depends on my mood. (3) Hooked by Nir Eyal. What do I expect to gain? With the 2nd and 3rd books, it’s to reinforce stuff I already know and both also point out useful tips for my business. The first is just a fascinating read about human nature and it’s purely for pleasure. Previously, I was reading this book called “Hooked” by Nir Eyal. It’s about how to build habit forming products, another must read for founders who care about driving customer engagement. This book showed me the case study of how Facebook, Youtube & Uber turn technologies into compulsions if not fully-fledged addictions. It provided me the step by step on how I can position my product into a “painkiller” that solves real problems, instead of a “vitamin” that appeals to users’ emotional rather than functional needs. I am now reading “Hooked” by Nir Eyal. I expect it to give me more and better insight on how to build the next level products. Question: What books would you recommend to young people interested in your career path? Why? ‘Design for a Perfect Screen’ by Tal Florentin. Reasons: Basics of design, user psychology, designing for business. ‘Hooked’ by Nir Eyal. Reasons: Learning about habits and its impact on digital products. Reasons: Personal branding, freelancing, finding clients. ‘ANYWHERE’ by AND CO. Reasons: Working remotely, work + travel, networking. Hooked had a huge impact on me. It has turned me into a better product guy, it has taught me how I can get into the minds of the end users and make them do what I want them to do (of course in a positive way). The book and the hook model itself is well researched, interesting and thought-provoking. 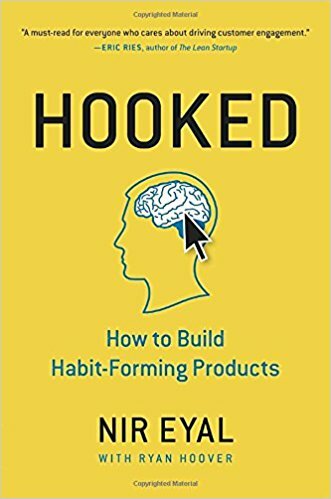 Hooked: How to Build Habit-Forming Products by Nir Eyal. It changed the way I think about product and helps you to be hyper focused on what matters rather than what is cool for your users. How do successful companies create products people can’t put down? Why do some products capture widespread attention while others flop? What makes us engage with certain products out of sheer habit? Is there a pattern underlying how technologies hook us? Nir Eyal answers these questions (and many more) by explaining the Hook Model—a four-step process embedded into the products of many successful companies to subtly encourage customer behavior. Through consecutive “hook cycles,” these products reach their ultimate goal of bringing users back again and again without depending on costly advertising or aggressive messaging. Hooked is based on Eyal’s years of research, consulting, and practical experience. He wrote the book he wished had been available to him as a start-up founder—not abstract theory, but a how-to guide for building better products. Hooked is written for product managers, designers, marketers, start-up founders, and anyone who seeks to understand how products influence our behavior. Practical insights to create user habits that stick. Actionable steps for building products people love. Fascinating examples from the iPhone to Twitter, Pinterest to the Bible App, and many other habit-forming products.